From there it is easy to click on the particular timetable you need in PDF format. Anyone with any queries about the new scheme should contact the Sustainable Travel Team on 01387 260383 or visit www.transportscotland.gov.uk for further information. 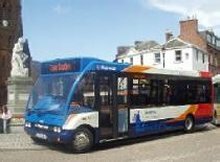 Timetables and journey planner for all bus, rail, coach, air and ferry services in Scotland and connecting to other parts of the UK.